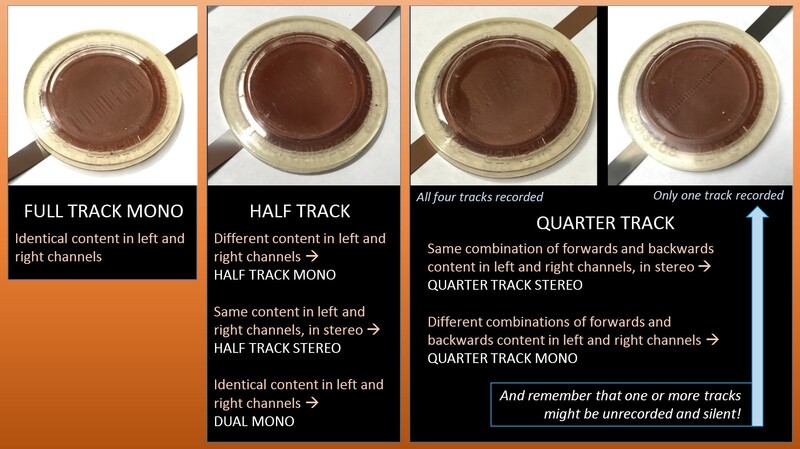 At the ARSC conference a few weeks ago, I explored the quality control system we developed for the audio/video side of MDPI, including the different types of QC we use. At the highest level, we recognize two basic QC types: automated (machine-based) and manual (human-intensive). Automated QC is machine-based and carried out by software tools, while human-intensive QC is a manual process that relies on the human senses of sight and sound as well as on our capacity for logic and reasoning. These may seem like very different strategies, but in truth, the two types of QC make use of each other. For example, human cognition is necessary to interpret the software output of machine-based QC while machines must render the digital files that are analyzed using sight and sound. 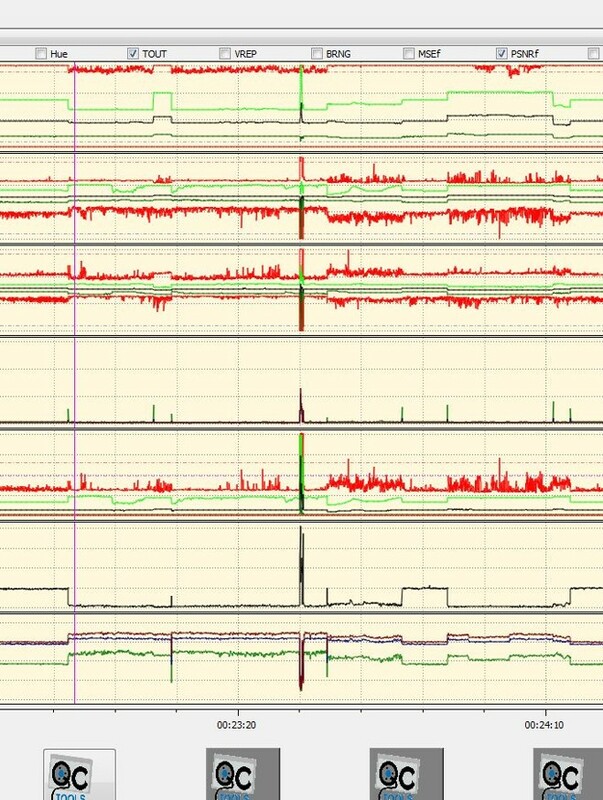 Human-intensive QC, on the other hand, features an MDPI staff member listening to and/or viewing digital files to judge the accuracy of characteristics that are typically not assessed well by machines. For example, open reel audio tapes recorded in the field occasionally exhibit problems like reversed audio or changes in speed. These issues cannot be accurately discovered by machine. Nor can the problem of mixed up audio/video content and its corresponding metadata that obviously and mistakenly refer to different recordings. Value-based QC—directing more QC resources to formats, collections or recordings that are considered of higher value and fewer to those deemed less valuable. For example, the project digitized a limited number of commercial LPs and 45s. IU curators told us that, while these were valuable enough to digitize, they were significantly less valuable than other formats. In their estimation, directing fewer QC resources to these formats in order to make available resources for more in-depth checking of valuable formats was worth the risk. Risk-based QC—analyzing digitization workflows and digitized formats to identify where risk is greater and directing more resources to those areas. For example, we define the time period in which something new is started or something is changed as carrying greater risk. Therefore, when the digitizing operation begins a new format, hires a new person, or begins using a new machine, the QC operation will allocate additional QC resources for a specific period of time to mitigate the risk. A video file being analyzed in the QCTools program. This visual output helped the QC operator to discover a clogged tape head. It is also useful to analyze a digitization workflow to define workflow steps or procedures that may carry greater risk. The azimuth adjustment step in an open reel audio tape or audiocassette workflow, for example, is somewhat subjective and relies upon the judgement and accuracy of the operator. The only way to check this step is to compare digital files to playback of the digitized recording. This prompted us to implement another type of quality control that we call Direct QC in order to assess this variable. Direct QC compares part of the digitized recording directly to the corresponding part of the digital file that was created during digitization to assess the accuracy of the azimuth step as well as other workflow steps and choices. There is much more to say about quality control for media digitization operations. Look for future posts about the MDPI QC operation. 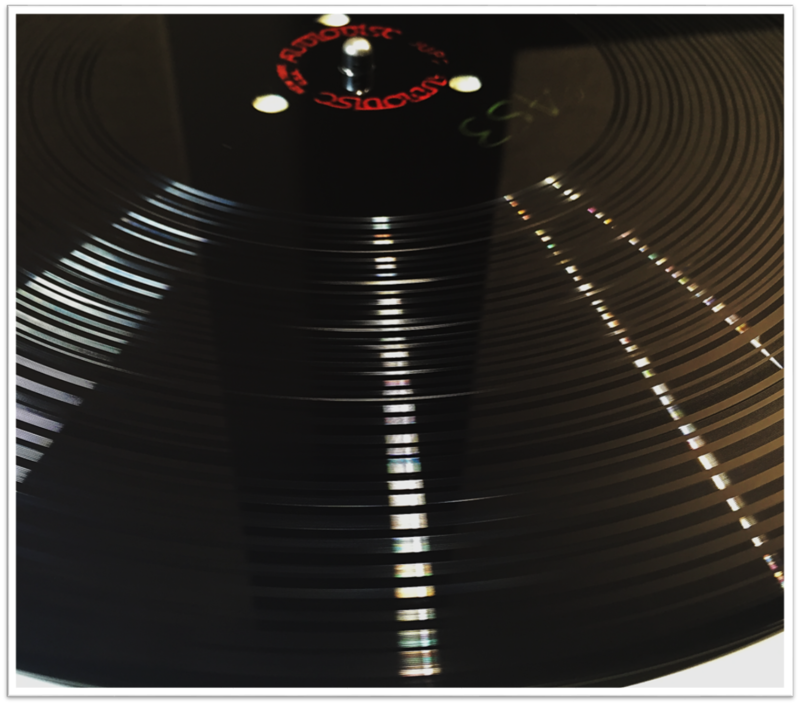 The content of this post originally appeared as a presentation given at the 2017 Association for Recorded Sound Collections Conference. In our time working at MDPI, we have come across a few wild things: unique media objects that presented interesting challenges. In Part One of this series we looked at some unusual items from open-reel tapes. For the second part of this series, we will look at interesting lacquer discs. One of the more visually unusual discs that was discovered was this wild thing. 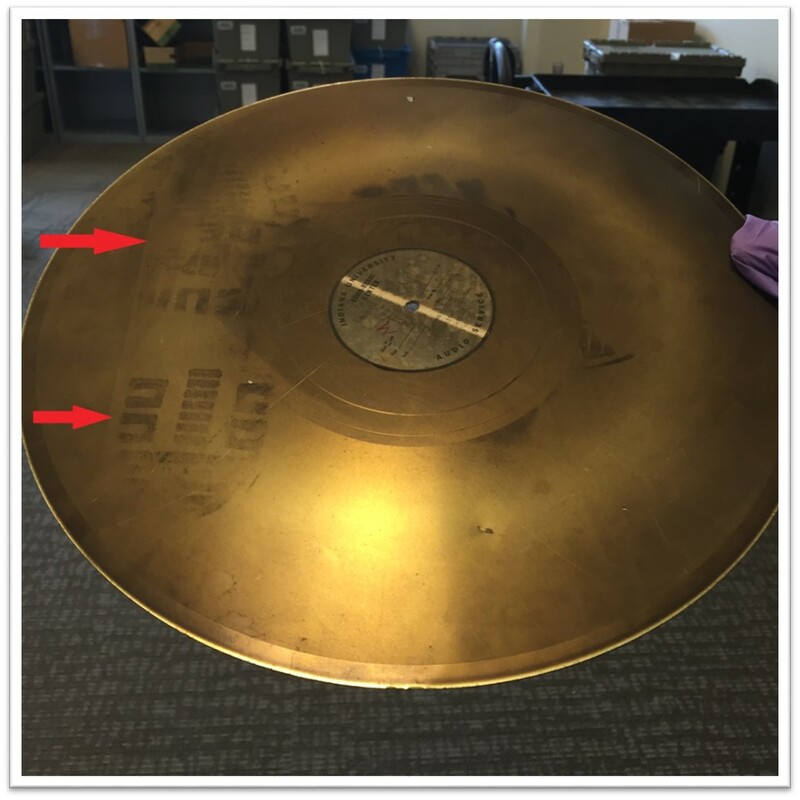 It’s what we all refer to as the “golden disc.” For reasons unknown to us, the disc turned bright gold. If you look closely, the red arrows point to a definite boot print on it. The boot print can be somewhat explained, but the golden hue of the disc is still a mystery. The other side of the disc is blank but has not turned this golden color. Although the disc still has its grooves and is playable, we have set it aside until we decide the best way to digitize it. There have been a number of odd examples in the realm of lacquer discs. We have seen a smattering of visually-strange examples, and a helping of sonically-strange examples. There have been lathe speed issues, stability issues, and cutting errors that have led to some pretty wild cases. 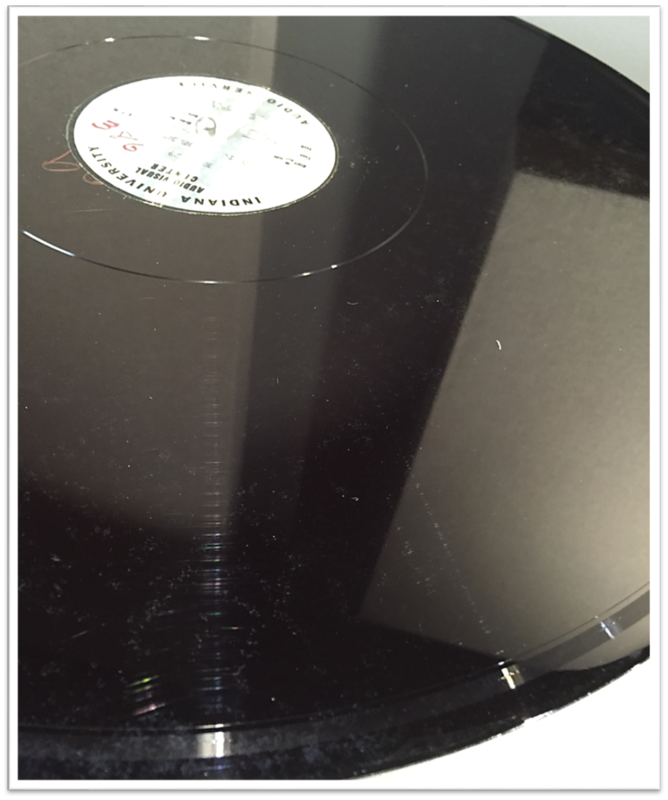 Although the label on this lacquer seemed to indicate that there was content and that it was the first side of a four-side concert recording, the disc was completely un-cut. Perhaps a mistake on the part of the recording engineer? This 16″ disc from our School of the Sky Collection was used to record 15 seconds of content. Not very eco-friendly! On the other end of the spectrum, another disc was found to have 35 discrete bands of content, all separated by locked grooves requiring manual stylus placement for each section. The content was all takes of a group of children singing “Skip To My Lou” for a film production. The kids would get going, sing a few seconds, then be cut off by the director. This disc has a mysterious orange halo which appears around the label area of the disc. This phenomenon appears somewhat frequently in the School of the Sky collection. Upon close examination, the halo area appears translucent and the aluminum core can be slightly seen underneath. Why something like this would occur, we don’t know. Many guesses were made but the only guess that seemed plausible is that it was a quality control issue by the blank disc manufacturer. 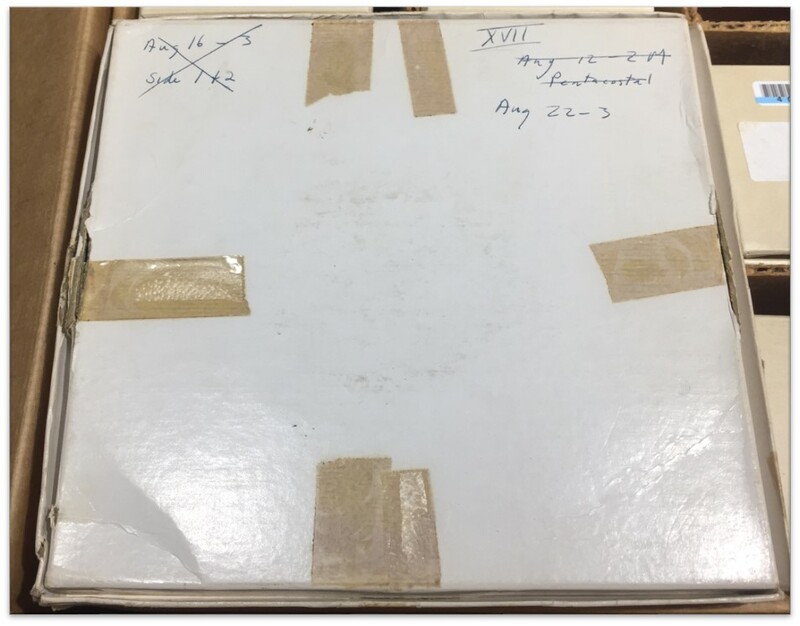 This disc is what we refer to as the “pizza disc.” Our speculation is that someone—perhaps the lathe operator or, most likely, the music performer—did not want this side of the record to be heard, so they scratched lines into the record. At some point in the disc’s life, a “slice” of the lacquer material fell off leaving a reflective area where the lacquer once was. The piece was not in the original sleeve with the disc so the audio was unfortunately irretrievable, at least for now. Then there are the oddities that you don’t discover until you actually play the disc. Simultaneous content is commonplace to hear on tape when playing back content on the wrong playback head. However, it is a lot more uncommon to find content from two separate programs playing simultaneously on a lacquer disc.The violin recital was the intended content, but somehow a good amount of an opera performance entered the signal. It is possible this was originally recorded on tape and transferred later to disc. 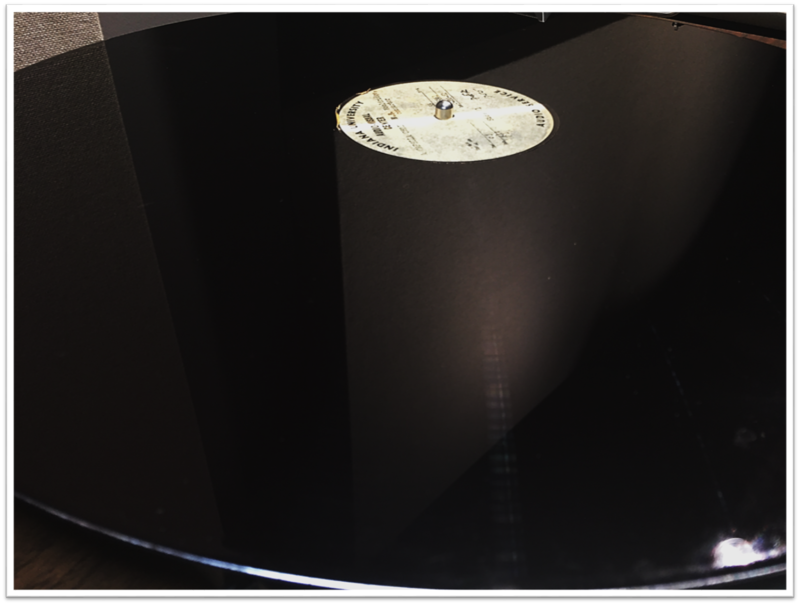 Another more commonplace tape issue is backwards content, but it is quite unlikely on lacquer disc. Backwards content was found at the end of this organ recital. Speed changes are also commonplace on tape but less frequently found on discs. The content on this disc slowed down, sped up, then repeated content, all while playing back at a consistent speed. The repeats were cut into the groove. We hope you enjoyed seeing and listening to some of our many wild things as much as we enjoyed digitizing them. Dan and Melissa will have a new presentation at the upcoming 2018 ARSC Conference on our cylinder digitization project. Hope to see you there! Digitally preserving over 275,000 audio and video recordings, and then adding film, in less than three years is no trivial matter! The scale of this project is huge and its challenges are wide-ranging, complex, and ever-present. You probably already knew this, at least intellectually. However, our blog team thought that this video compilation by Carla Arton, Director of Technical Operations for film, might provide more of a gut-level understanding. Carla used the app “One Second Everyday” to create this montage of the MDPI project. Enjoy! 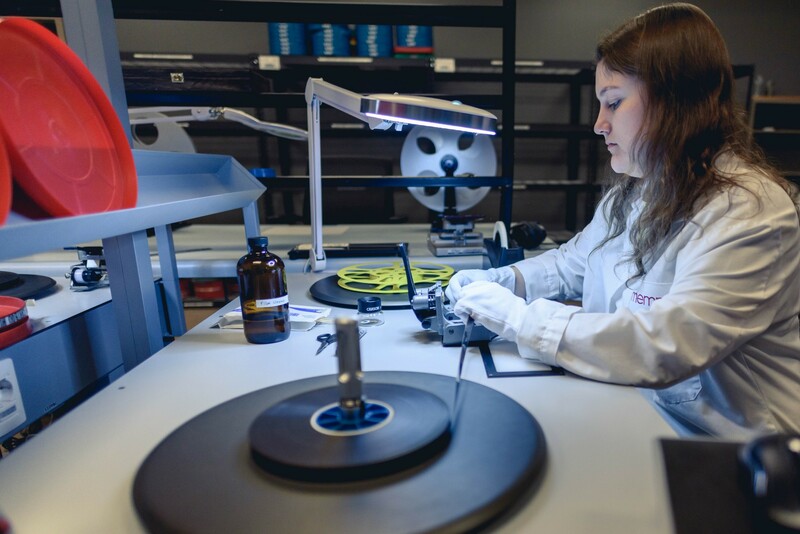 In 2015, Indiana University launched the Media Digitization and Preservation Initiative (MDPI) aimed at digitally preserving and making accessible 280,000 audio and video items held across the Bloomington and regional campuses. 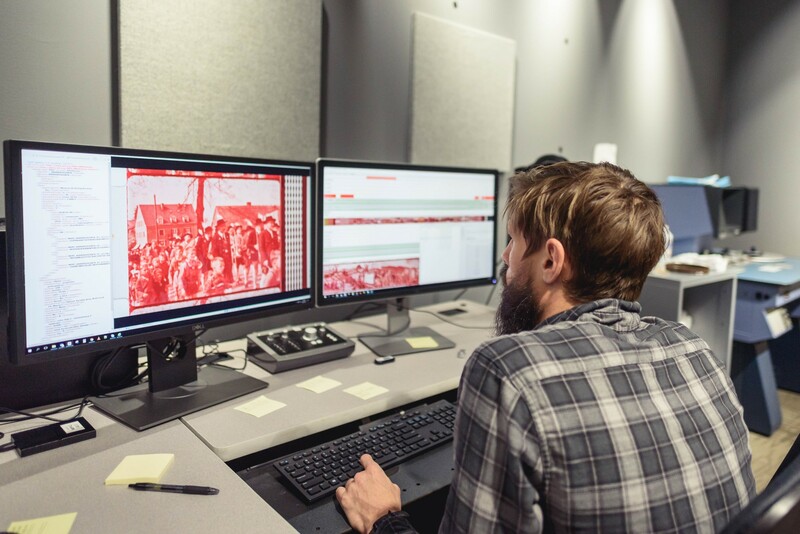 In 2017, IU announced and launched the second phase, the digital preservation of 12,500 hours of film (more than 25,000 reels, or 22 Petabytes, from the over 100,000 reels held on campus) to be completed within three years to coincide with the IU 2020 Bicentennial. 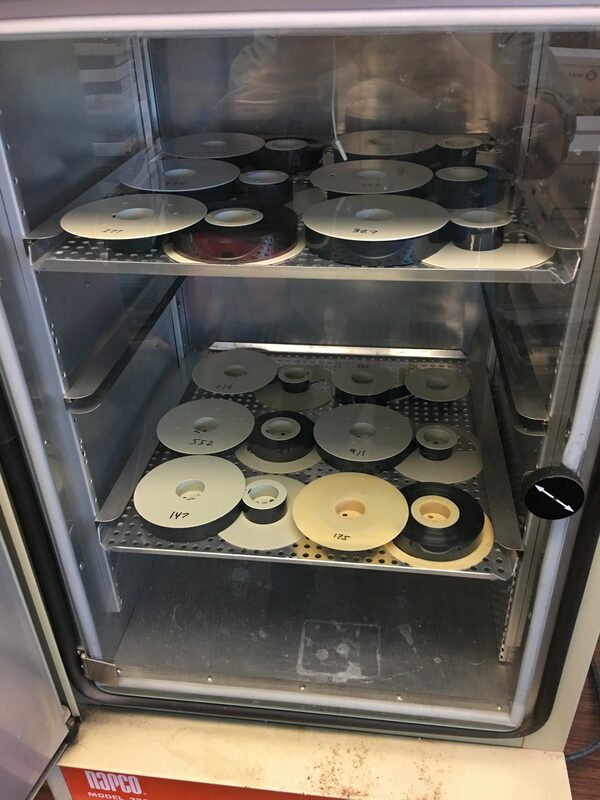 After digitization IU’s films are returned to the Ruth Lilly Auxiliary Library Facility (ALF), where they are stored at a temperature of 50 degrees Fahrenheit and a 30 percent relative humidity. 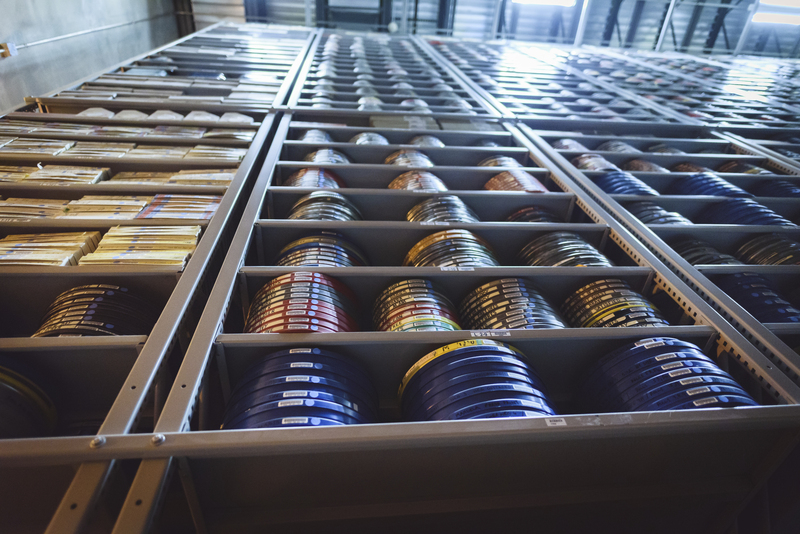 Seven months into this new phase, we have moved from testing to production with our on-site vendor, Memnon Archiving Services, and have digitized over 1,400 reels (over 500 hours). Along the way we have overcome multiple implementation challenges and hired a team of specialists and graduate students to support our already extensive network of full time staff across multiple IU departments. We have renovated workspace and purchased and installed equipment, workstations and production software, as well as developed new infrastructure systems and adapted existing ones to handle the large archival information packages of preservation, production and access files (1.5 Terabytes per hour of 2k resolution). A Memnon technician inspecting and repairing film reels to prepare them for scanning on their Lasergraphics Scanstations. Hired Quality Control and Post-Production Specialists, Assistant Film Archivists, Preparation and Returns Manager, multiple hourly graduate assistants. 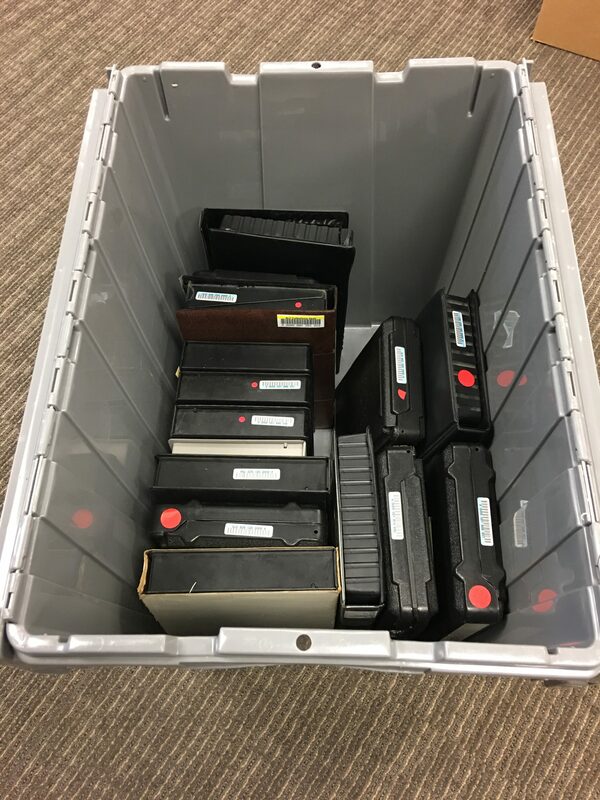 Launched an internally built Film Database for the IU Libraries Moving Image Archive (IULMIA) and integrated it with MDPI’s Physical Object Database (POD) for selection, preparation, work order creation, and physical tracking. Renovated workspace, purchased and installed film inspection equipment as well as hardware and software for quality control and post-production/restoration suites. Adapted post-processing infrastructure to accommodate film specific file ingest, automatic quality control checks, incorporated manual QC software, and derivative creation for online streaming. 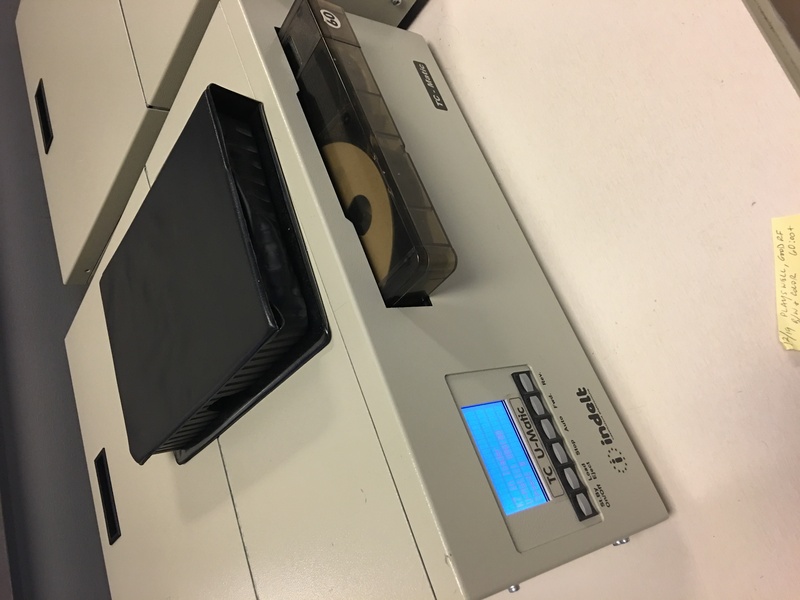 Delivered first physical batches to the vendor and successfully received and archived first scans into the digital archive from IULMIA’s educational reference print collection. Hired a Film Digitization Specialist, post-production Catalogers, and hourly Copyright Research Assistants. Identified and resolved scanner and production workflow issues; refined physical and digital workflows. Successfully carried out first film restoration and ingest into the digital archive. Implemented an On-Demand scanning workflow for current researchers and screening events. Began scanning pre-production film elements from the IU Libraries Moving Image Archive. 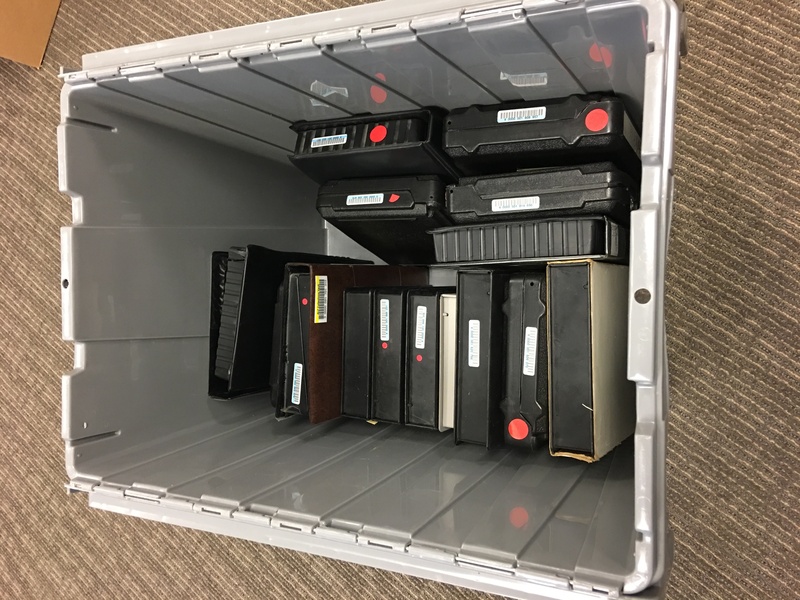 As we move forward into the project, we will bring in films from other special collections on campus, further adapt scanning workflows and increase production speed to meet our ambitious three year goal. Quality Control Specialist, Charlie Allen, evaluating the overscan of a faded print using VidiCert’s film analyser and summary suite. Future blog posts on the film phase will highlight individual stages of the workflow and the collections being preserved. In the meantime, check out the Moving Image Archive’s Instagram to see images of films being inspected and prepared for digitization. On October 16, 2017, the Indiana Daily Student published an article in the student life section entitled, “Hearing Home” written by Lydia Gerike. 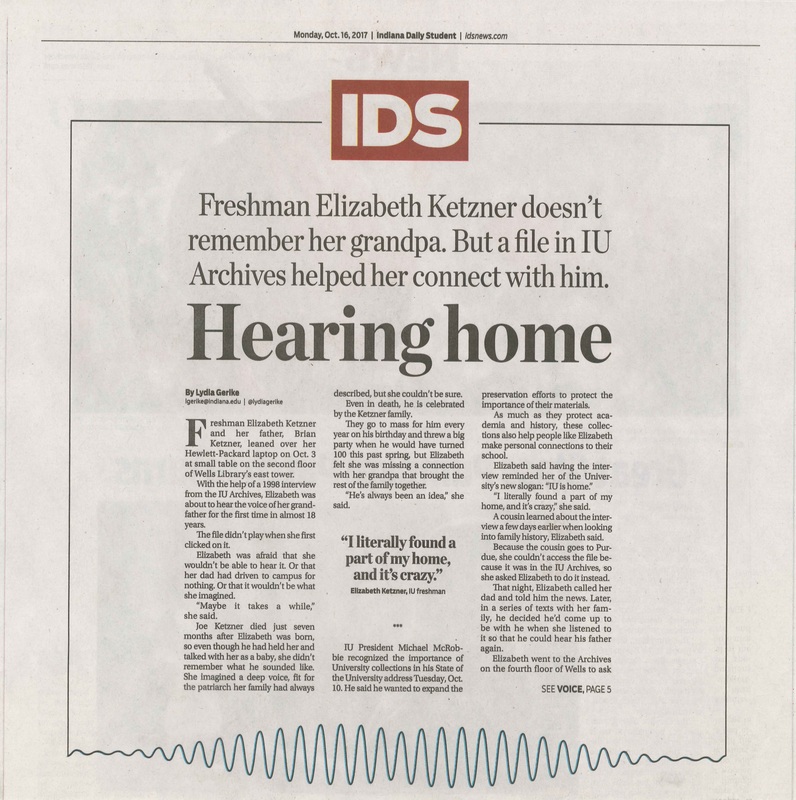 The article described how freshman Elizabeth Ketzner had the opportunity to hear the voice of her grandfather, Joseph Ketzner, who had died when she was a baby, in an oral history interview recorded in 1998. She had even invited her father to come to IU and listen to the interview for the first time with her. Elizabeth initially came for a copy of the interview transcript. When I told her that I could provide her with digital audio of the interview, a sweet smile lit up her face, and she said, “You mean I can hear my grandfather’s voice?” It was a moving experience for them both, and they were grateful that the interview had been preserved and made available to them. 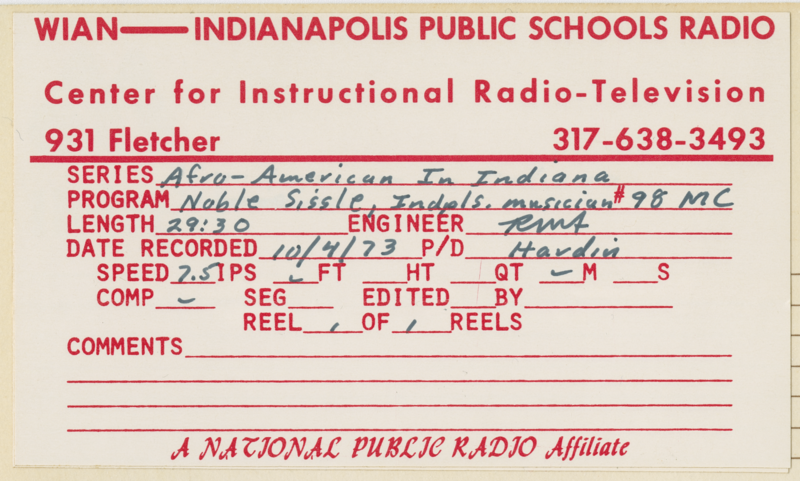 This tape was digitally preserved by the IU Media Digitization and Preservation Initiative. Mr. Ketzner’s interview is part of the IU oral history collection currently held by the Center for Documentary Research and Practice in the Media School. The Ketzner interview is one of over 2000 interviews collected for over a hundred oral history projects. The oral history collection began in 1968 with a project to record histories from IU alumni, staff, and faculty as part of the commemoration of the IU Sesquicentennial. That first project contributed data to the multi-volume history of Indiana University written by Thomas D. Clark, a faculty member in the Department of History. The project was also the springboard for Oscar O. Winther, another faculty member in History, to create the IU Oral History Project. Other research projects followed. This era was the heyday of social history, a push to open up history to other voices and multiple points of view. Oral history methodology is a natural fit for social history research, being grounded in the principle that every person’s story has value. 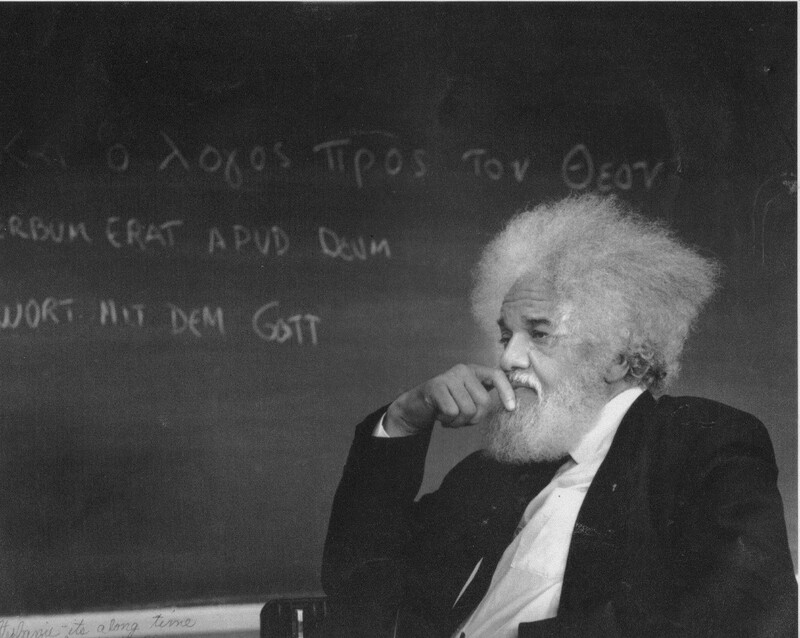 The Ketzner interview is part of an oral history project called, “Dubois County: A Home for God’s People.” The project examined the interrelationship of religious and communal identity in a county largely settled by German Catholic immigrants. This project was one of six projects conducted in Dubois County between 1993 and 1999 by a graduate student in the Department of History, Heiko Muehr. For anyone interested in learning more about the CDRP or searching the collection, please contact me at 812-855-2856 or email barbara@indiana.edu. Here at MDPI we deal with our fair share of decaying media. One of the most problematic video tape formats is U-matic, also referred to as ¾”. Any video preservation engineer who has been in the business long enough can attest to this. 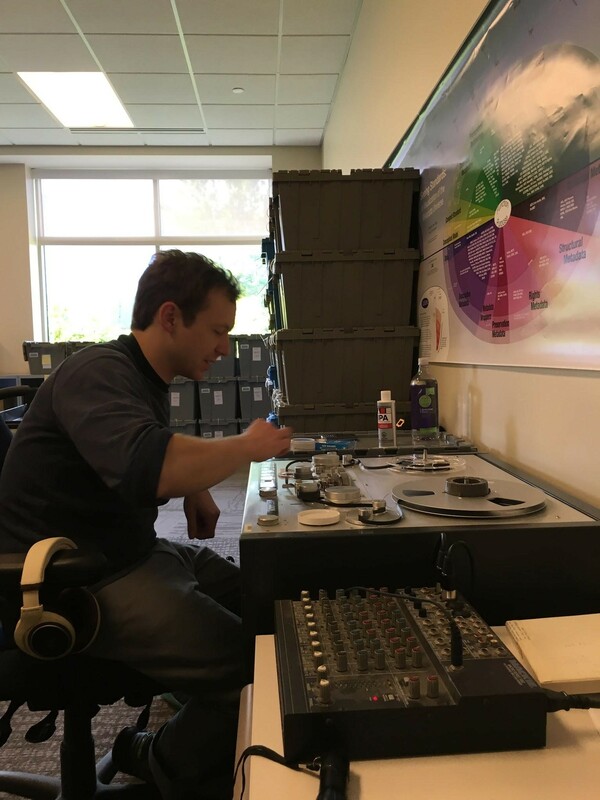 Our partners at Sony Memnon digitized the bulk of the U-matic tapes via a parallel transfer workflow, but tapes that their operators had difficulty playing were sent to IU Media Digitizaton Studios (IUMDS). 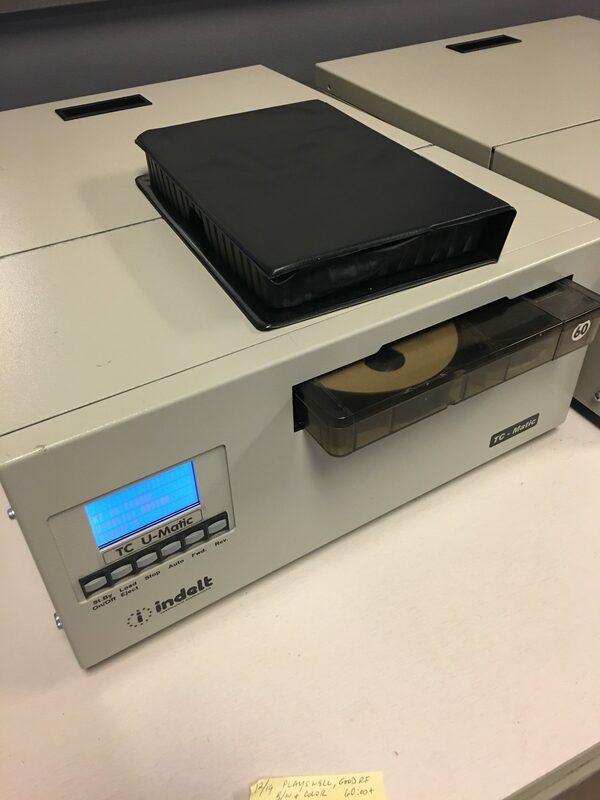 IUMDS is charged with digitizing recordings that require special care or extraordinary intervention, so we get the worst of the worst. We have lovingly come to refer to our shelf of the most problematic U-matics as our Island of Misfit Tapes. This tape was found to have some sort of leftover silky insect nest attached to the tape and one of the metal guides. The critter had long since vacated the premises, fortunately. A bit of treatment with some alcohol on a cotton swab and the tape was ready for transfer. 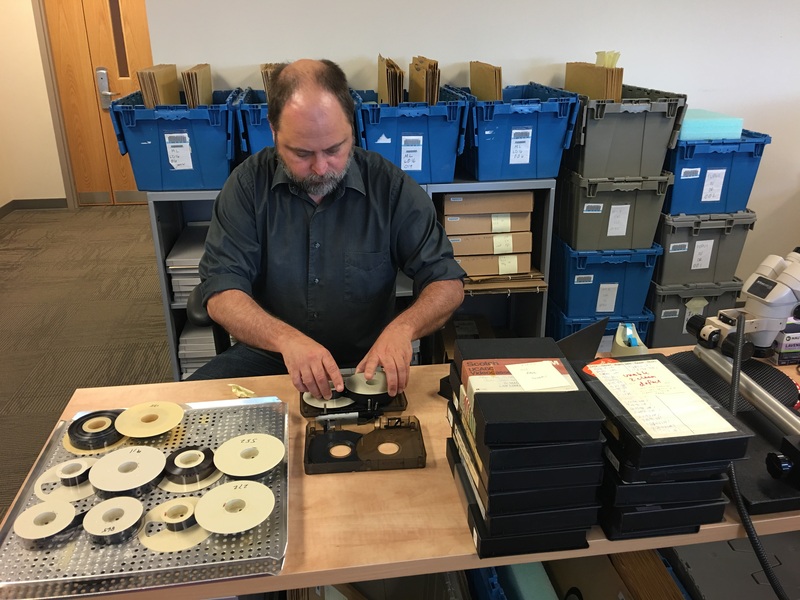 Of the approximately 15,500 U-matic tapes delivered to Memnon for digitization, 1,100 or about 7% failed to make it through the digitization process for a myriad of reasons. It is up to us to determine why they failed, take remedial steps to correct any problems and make the best transfer we can. A bin of U-matic tapes that have been failed and need to be repaired. We first determine if the physical tape is still intact. If broken, did the break happen at the beginning or end of the tape leader or in the middle of the program? This is a fairly easy problem to fix by opening the tape and splicing with a special splicing block custom-made to hold the ¾” inch tape straight and even. 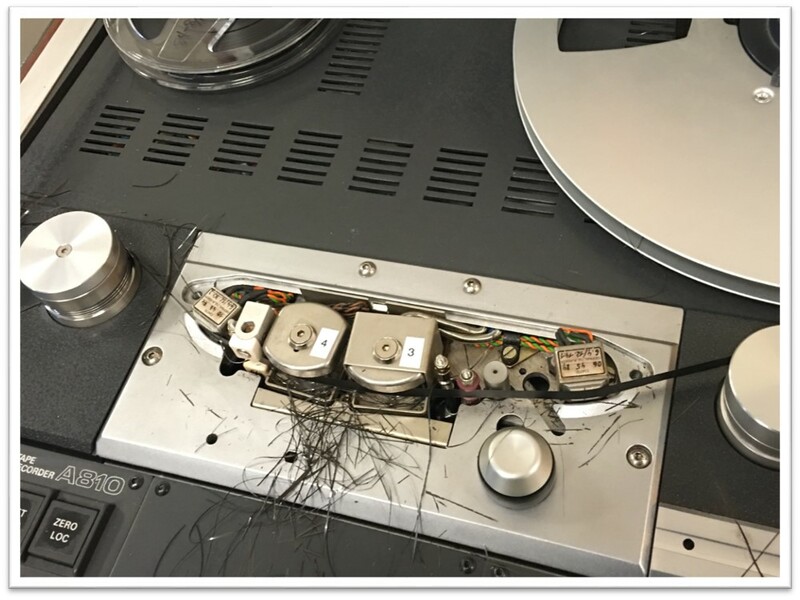 We trim damaged areas of tape and make a clean-butted splice, taking special care to apply the tape on the side facing away from the spinning scanner of the playback VTR. AV Specialist Jonathan Richardson repairing a broken tape. The next step is to clean the tape. We use an Indelt tape cleaner on most U-matic tapes. The Pellon tissue within the cleaner removes any loose residue or foreign matter from the surface of the tape. Multiple cleanings are often necessary if head clogs persist. An Indelt TC U-matic tape cleaning machine. If the initial cleaning doesn’t do the trick, additional inspection is needed to determine if the tape is displaying characteristics of sticky-shed syndrome. Sticky-shed is created by the deterioration of polyethylene binders in a magnetic tape, which hold the oxide coating to its plastic carrier. The binders break down over time due to the absorption of moisture in a process frequently referred to as hydrolysis. A tape with sticky-shed will respond sluggishly to tape transport functions in a VTR, making squealing or chirping sounds and leaving a dark residue behind on any surface that it comes in contact with, especially the video heads. 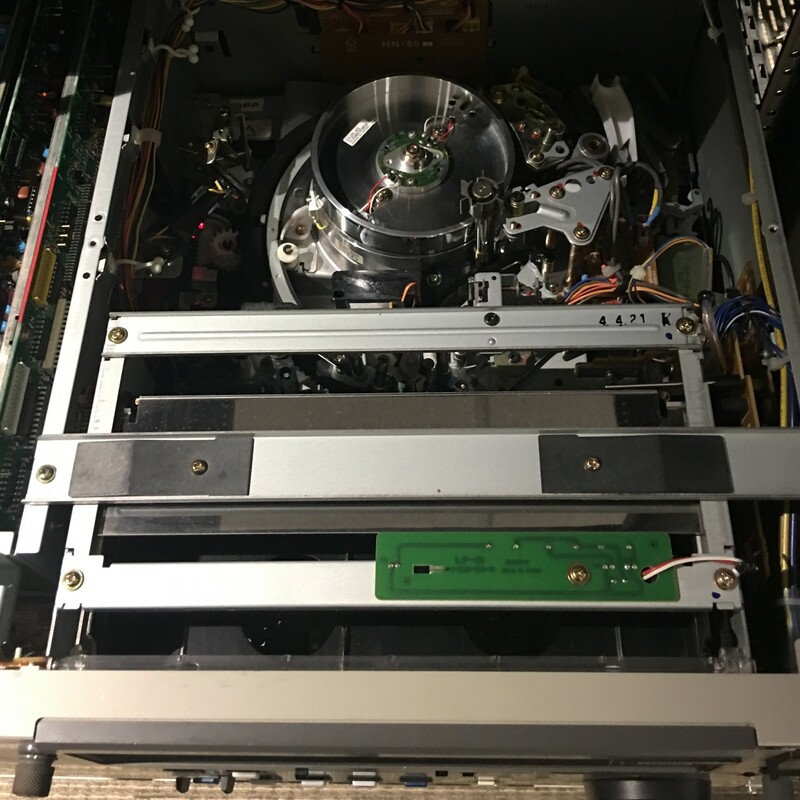 The inside of a Sony BVU-900 U-matic machine. Sticky-shed symptoms can occur immediately at the head of a tape, or they may show up 20, 30 or 40 minutes into a program. In these cases, as more tape is spooled onto the take-up reel, harm can be done to the tape as well as the tape deck if playback isn’t halted. Once sticky-shed is confirmed, the tape should be immediately ejected from the VTR and scheduled for baking. Once a tape has been baked, it is necessary to run it through the cleaner at least once, sometimes twice, before attempting to digitize again. Tapes baking inside of oven. We have three scientific ovens specifically for baking audio and videotapes. 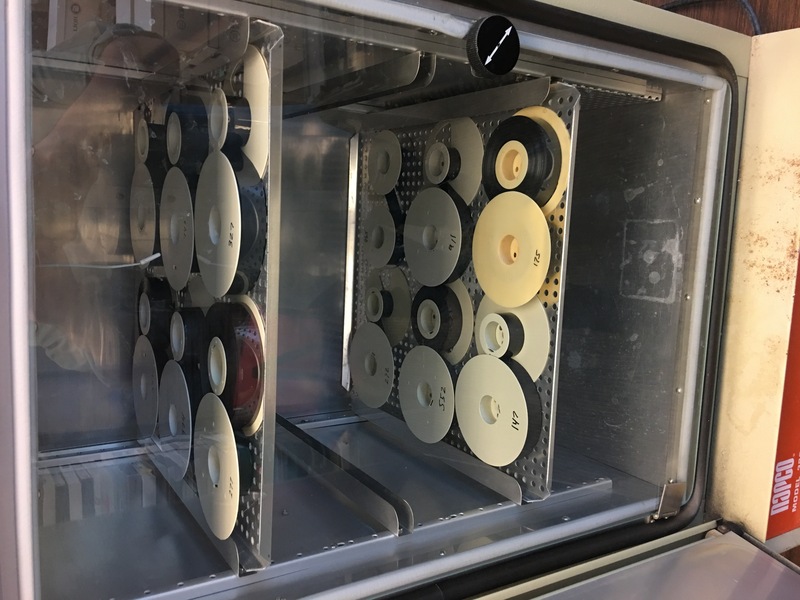 In our experience, we have found that three U-matic tape brands are the worst offenders relative to sticky-shed problems—Sony, Ampex and Agfa. The Agfa brand tapes are by far the most troublesome for us with Ampex a close second. We have experimented with different combinations of baking durations and temperatures, and currently we prefer to bake at 120°F for 48 hours with convection fans running for a more even penetration of heat into the wrap of the tape. We have found that taking the reels out of the shells is the best way to make sure that the baking process is successful. Leaving the tapes in the shells risks the warping and damaging of the shell or, more importantly, the tape guides. After baking, another cleaning is done and digitization is attempted again. We are currently experimenting with even longer bakes for tapes that haven’t responded well to the two day bake. The successful migration of problem U-matics requires many man-hours of patient testing, treatment and re-trying, but one by one, day by day we are able to liberate another video from the Island of Misfit Tapes. 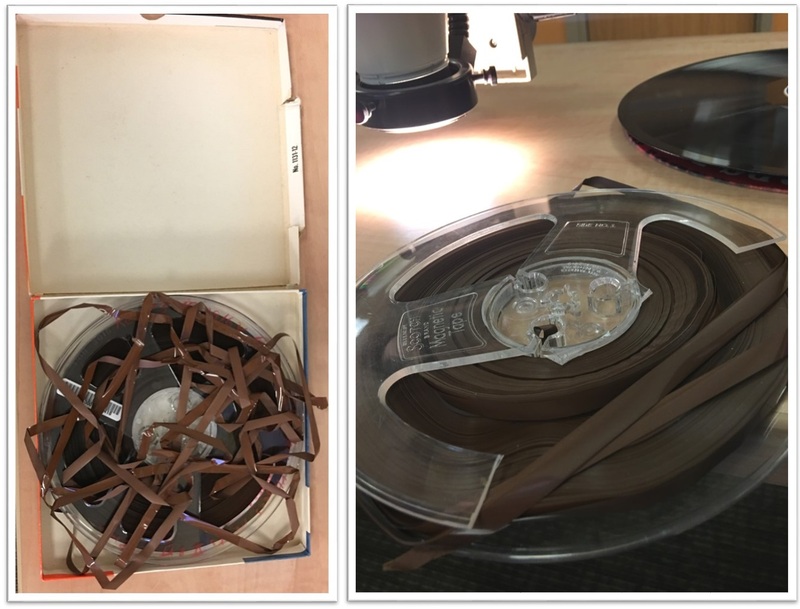 Until May 2016, MDPI sorted open reel audio tapes into groups for digitization based almost entirely on a straightforward physical inspection: looking at the tapes themselves, reading the technical information written or printed on their boxes, and so forth. That approach worked well as long as our preservation work was limited to relatively consistent and well-documented materials, but once we began digging deeper into Indiana University’s holdings, we found that the information we needed to sort tapes by technical characteristics was either missing or—worse—shown incorrectly. No matter how intently we stared at a tape, held it up to the light, measured it with calipers, or compared it to previously digitized open reel from similar collections, we were not improving our odds of a tape being successfully digitized. It was clear, as described in Part One, that a different solution would have to be found. 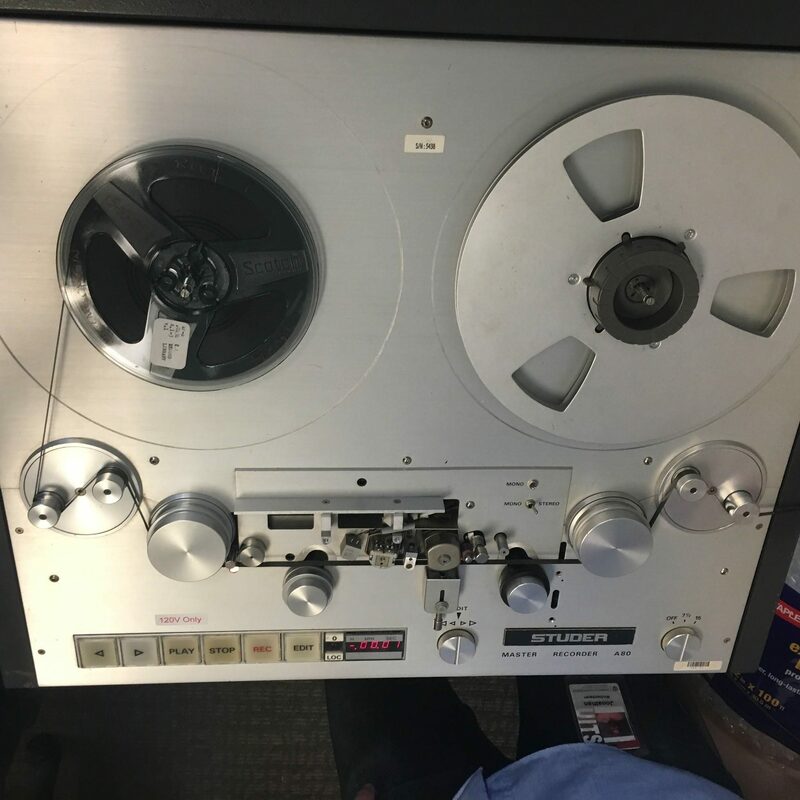 It was decided that the only way for us to get this critical information would be to actually play the tapes on a machine and listen to the recording. We were given two tools in order to accomplish this task. 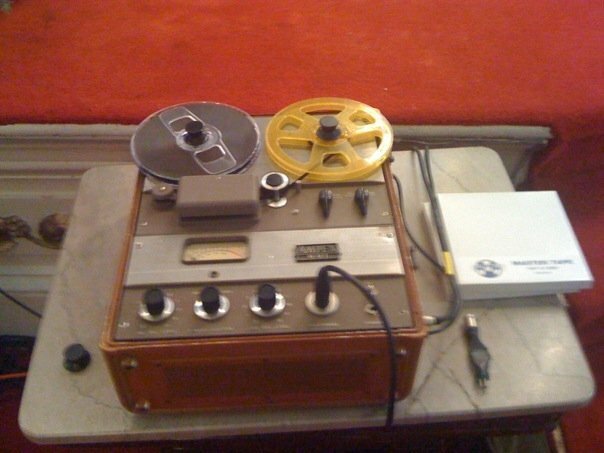 The first was a Studer Model A80 ¼” open reel audio playback machine with a half track tape head. The second was an Arnold B-1022 Magnetic Viewer. For the uninitiated, a magnetic viewer is essentially a liquid and iron filled small flat object, metallic on the underside, and clear on top so that the iron can be seen. The viewer is placed over the recorded side of the open reel, and the iron reacts to the magnetic tape and aligns with the signal so that it can actually be seen visually! Here is the Arnold magnetic viewer attempting to display the signal of a Full Track tape. The signal is extremely weak, therefore the iron is not reacting to the magnetized recording. A select group of experienced members of the SMARTeam were trained on the use of the playback machine and given the responsibility of diagnosing and sorting open reel with unknown or contradictory technical specifications. Below is a brief rundown of the things required to diagnose each tape, and some of the more… eccentric ways recordists chopped up their track configurations while recording. The machine has only two speed settings, 7.5 inches per second, and 15 ips. What happens if the tape was recorded at a different speed? Well, a 30 ips tape played at 15 ips will sound too slow, and a 3.75 ips tape played at 7.5 ips will sound too fast. Unfortunately, it can be hard to tell a 3.75 ips tape from a 1.875 ips tape in this way, but we had occasional access to another machine with a 3.75 ips setting for resolving the difference between those speeds. The author using the magnetic viewer to identify the track configuration of a tape. Also pictured: the sound mixer, headphones, and alcohol and swabs which are used to clean the machine between every other acetate tape, and between every third polyester tape. A quarter track mono tape that is recorded fully, but every side is played in the same direction. Each side has discrete content. A quarter track tape that contains two forward mono recordings, and one forward stereo recording. A 30 second tape with a recording of a political jingle almost too short to thread in the playback machine. A tape with multiple problem stocks spliced together. In this case, a sticky shed polyester tape (sticks to itself and the tape heads, must be baked at a low temperature to alleviate) spliced to an acetate tape degrading from vinegar syndrome (a process in which acetic acid is released as the plastic tape base degrades, and in which the acetic acid acts as a catalyst, further degrading and breaking down the plastic). That one went to the IU Media Digitization Studios! Audiocassette tape (⅛” wide) wrapped around empty 1/4” reels. And these are just to name a few! The main problem we faced with this workflow was time. For a more difficult tape it might take as long as 15 minutes to diagnose completely, and even if the SMARTeam was lucky enough to hit a run of uniform tapes, there was still only one machine, and one possible operator at a time trying to keep up with as many as 650 tapes per week. Eventually we were able to hire experienced Memnon staff to augment our own workforce in order to maintain this pace, though it was later determined that to save time and effort it would be easier to incorporate the cost of diagnosis as part of the digitization package. The changes made to the workflow brought on by the shift to Memnon diagnosis will be the subject of Part Three. In our time working at MDPI, we have come across a few wild things: unique media objects that presented interesting challenges. For the first post in this series, we will discuss some of the wild open-reel tapes we have found. The tape on the left is an unfortunate sight to see, but it is a reality when artifacts have not been properly cared for or stored. The tape on the right is a similar problem that will probably take the same amount of time to fix. In both of these instances, the tape was rewound onto new spools and digitized without serious issues. Not so “wild,” but a little out of the ordinary of most of the tapes we see. Here is a real wild thing: Scotch 206 shedding. Scotch 206 is not on the sticky shed brand list, but this shedding or stripping still happens. Not all Scotch 206 tapes display this behavior, and luckily this is the only case we have come across. The large amount of shedding, or stripping as it could be called, happened in just a few seconds of play. As far as we know there is no surefire cure for this syndrome, so the tape has been set aside until we can come up with a way to safely digitize it. When creating a preservation master file, we capture the speed change twice. When the recording changes from 7.5 to 3.75 ips, we continue digitizing for an additional ten seconds. We pause the transfer and adjust the playback machine to 3.75. We leave a five-second gap of silence and then capture ten seconds of content leading up to the change to 3.75. Once that change occurs, we are now at the correct speed and may continue on with the rest of the tape. Many field recordings we deal with have at least a few of these speed changes. But then there are some that have way too many. This tape changed speeds 22 times! It was a field recording from 1961, where a woman was singing old songs that her mother taught her. She would sing, then pause to remember what the next line of the song was. Each time she paused, the recording changed from 7.5 ips down to 3.75 ips. When she remembered the next lyric and started singing again, it went back to 7.5! The person doing the recording was no doubt hoping for the best possible fidelity for the songs, and probably trying to conserve tape out in the field; however, she showed very little consideration for the preservation engineer some 60 years later. Here we have a spiritual group from the 70’s being interviewed about their career. Thankfully, they sang at the beginning of the interview, because the rest of the tape suffered from dying batteries and random speed changes. In this example, you hear the content speed up, then change speeds to 3.75. After we corrected for the change, it still didn’t sound quite right…. When we come across things like this, we digitize at a fixed speed so that proper time correction can be applied later on. Another issue with open-reel tapes is changes in track configuration. One wild example was a tape that started as full-track for about 40 minutes at 7.5 but then changed to quarter-track at 3.75. It changed back to full-track… then to half-track mono… then to full-track again! It went back and forth like this seven more times with plenty of stops, starts, different tape stocks spliced together, and wow and flutter issues. It sounds very dull, almost like the azimuth was out of alignment. 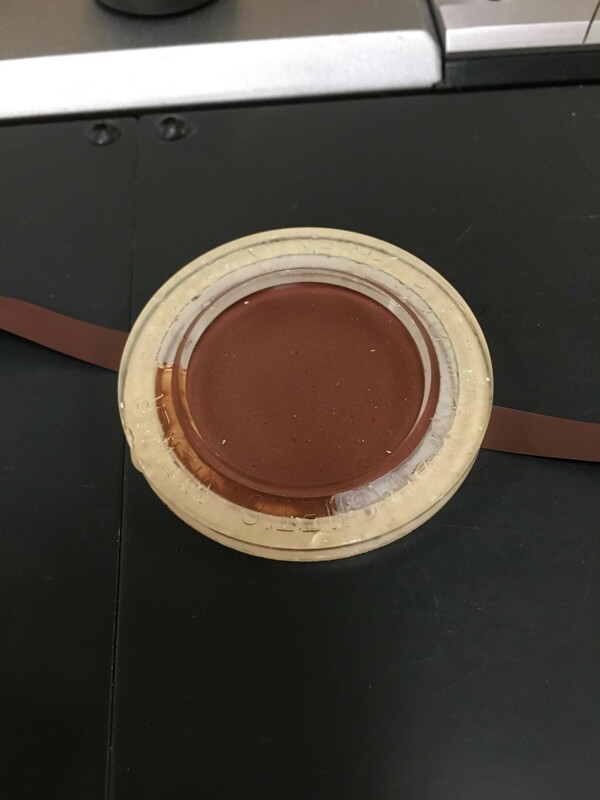 The magnetic viewer actually revealed that the content was a very narrow band near the center of the tape. We got much better results using track two of a quarter-track head. In this next example, the tape changed speed, direction, and track configuration all at the same moment! It started as full-track and went to half-track mono going in opposite directions at different speeds! At the change you can hear two different things happening: one is backwards music, and the other is a very slow voice that kind of sounds like Jabba the Hutt. In the effort to capture everything on the tape as accurately as possible, we start digitizing with a full-track head and then change our speed and tape head configuration, Once we are at half-track, we will digitize the left side at the appropriate speed and direction, and then the right. When we create the production master file, it reflects all of the content played back correctly. This post will continue with Part Two. 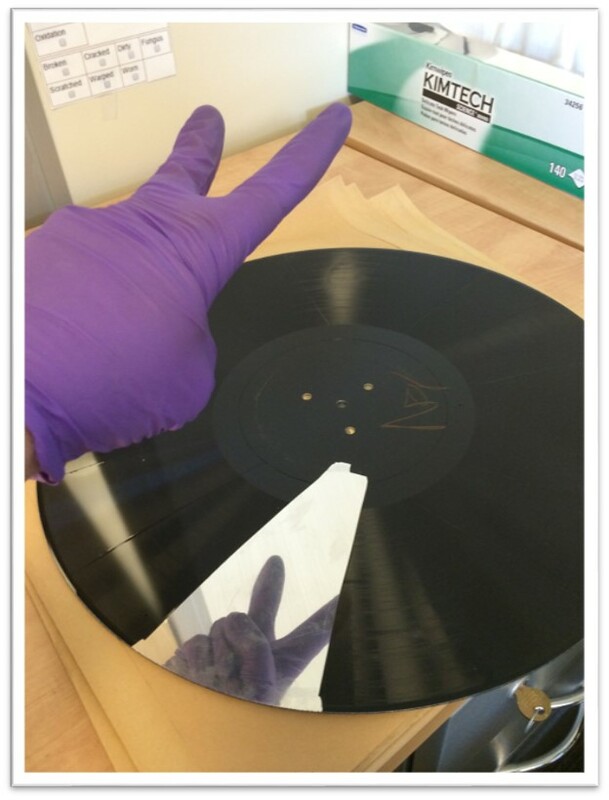 The archival recordings digitally preserved by the MDPI project have many potential uses. In this post, we highlight their ability to inform and inspire new creations. 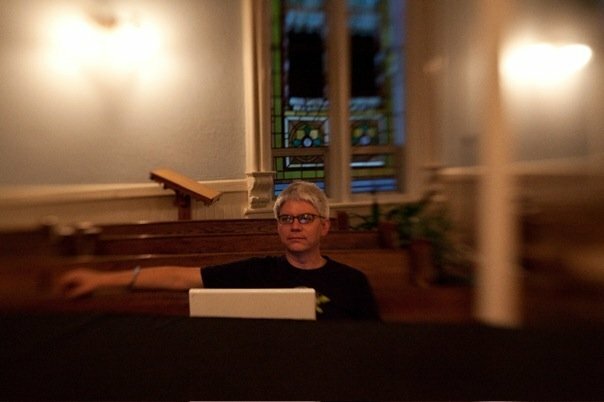 Audio engineer and producer Paul Mahern is well-known for his work with numerous artists including John Mellencamp, the Fray, Neil Young and others over the past several decades. From 2005-07 he worked at the IU Archives of Traditional Music (ATM) as the audio preservation engineer for the NEH-funded Sound Directions project, one of the forerunners of MDPI. 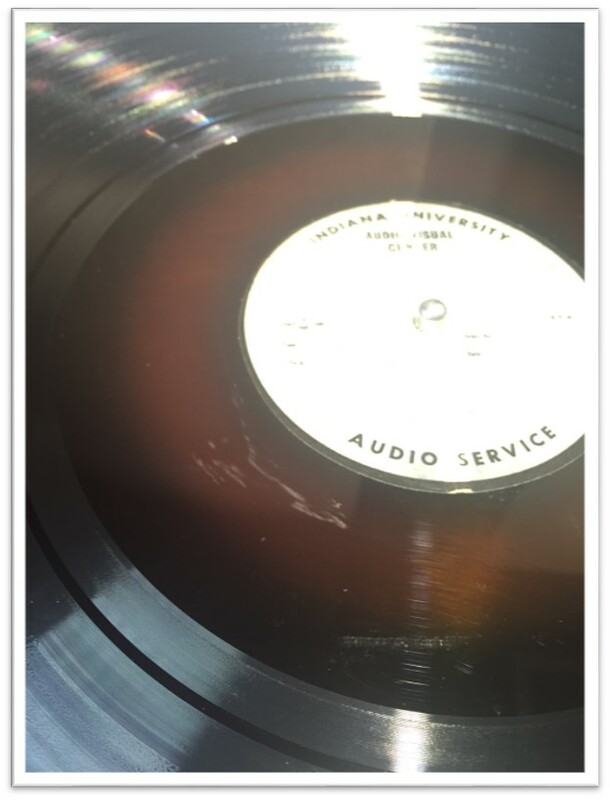 In this lightly edited excerpt from a longer interview with Jim Shanahan, Dean of the IU Media School, he talks about encountering one archival collection in particular that radically changed his ideas about recording music. Paul: There’s a collection of recordings at the ATM that were done with one microphone in the Congo in 1952 that were completely mind-blowing recordings. I grew up in multi-track recording, so you know when I came along we were already using 16-track, 24-track recording, multiple microphones, and big consoles. Listening to those recordings that were done in the Congo with one microphone, I began to realize that there was a way to do this minimalist mono approach and you would still have the depth of field, you could still feel who was closest to the mic and who was farthest away from the mic and it really changed the way I felt about what was important about a recording. Almost immediately after I left IU I got a call from John Mellencamp who I had made a few records with at the time. He said “Hey, I am going on tour with Bob Dylan and I want to make a record. I’ve got this group of songs but I want to make it remotely. I want to be able to record wherever. I want you to find the oldest recording medium that’s stable and I want you to come with me and we’re going to record these things with one microphone.” And so I felt like, oh my goodness, the government just paid to train me how to do this job that I just got from John. So I did that, and you know, we got an old Ampex suitcase recorder and refurbished it, rebuilt the machine, tried out a bunch of different microphones and basically made a record. Jim: So, was that quarter inch tape? P: Quarter inch mono tape. J: And that was the most stable early thing you could find. P: Yeah, I wasn’t gonna go back to a lathe. There’s just too many—lathes are heavy and they’re tricky. J: A lathe would actually be cutting a record. P: Cutting a record, that’s right. But you know, so you get five minutes before the record’s up. It’s just outside of our experience. J: So this was with one microphone? So you kind of situate the band around the microphone? P: Yeah. So part of the record was recorded at a church, and it was just John and his guitar player. They sat on either side of the microphone. That was the first session and we got about half the record that way, so that was pretty easy. The next session was actually done at Sun Studios. J: Did you have to find the oldest mic? Was that another rule, old mics? P: Yeah it was like the oldest stuff that would work. 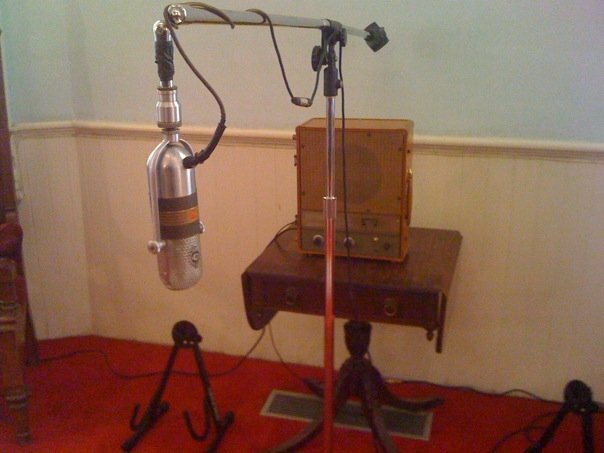 We ended up with the RCA77DX which has long been a favorite mic of mine. J: Well that’s cool. So it’s a consciously minimalist approach, probably harder in some ways than if you had 20 different mics I suppose. P: It’s different, it’s harder in some ways, but you know it’s all about the take. And it allowed me to have a little more control. I mean, I was just there mixing, basically as they were recording. “So John, when you get to the verse you’re gonna have to step forward. When you get to the chorus you’re gonna have to take a small step back. Cause you’re singing louder. Now, I’m not going to be able to do anything about this later.” So everybody’s like working together, you know. J: How did people react to it when they heard it? P: Some people that are friends of mine commented that it was amazing. I remember having this experience—when we were done, I put some of the recordings, not mixes, onto a CD and I was driving out to John’s house and I was listening to them and I was thinking “wow is this working, or not?” It’s like it’s so different to me. When I got there I pushed eject on the CD and the modern radio came on and it just sounded like white noise. The modern production, with the amount of compression and lack of dynamics, sounded like white noise to me and I realized that this was a special thing that we had done. Alan and Barbara Merriam collection, 76 open reel tapes recorded in 1951-52 in what is now the present-day Democratic Republic of Congo. 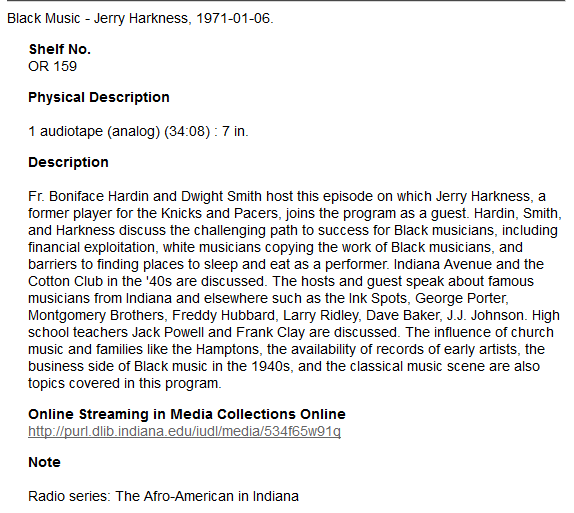 Accession number 66-127-F.
Black-oriented radio has long been one of the most popular topics of research at IU’s Archives of African American Music and Culture, but within the AAAMC’s black radio collections there were only a few brief mentions of activity within the state of Indiana. 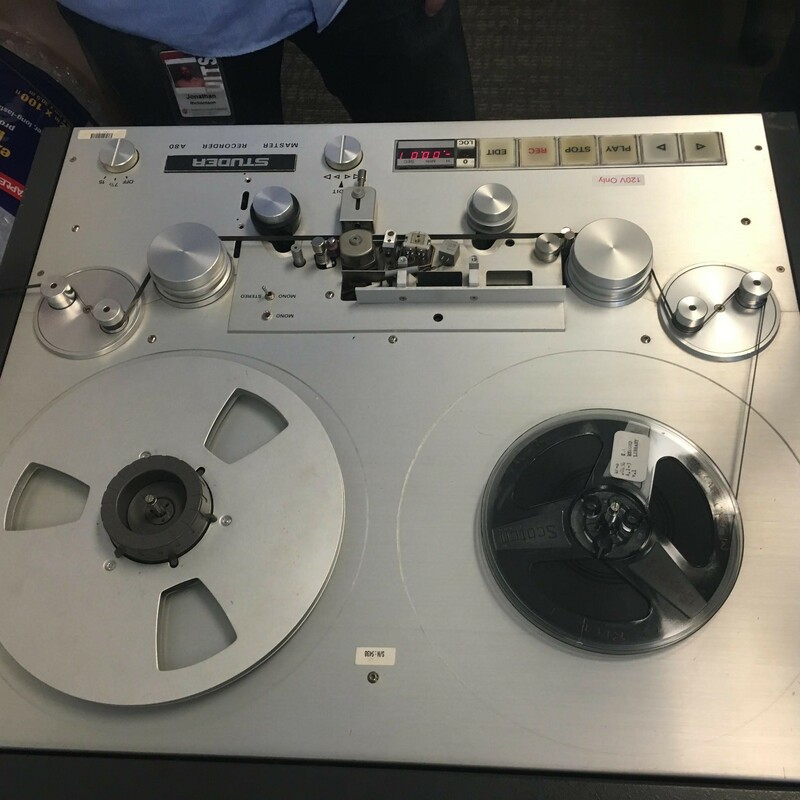 This all changed in 2014 when Nancy Chism, a retired IU professor and former Associate Vice Chancellor for Academic Affairs at IUPUI, sought our advice about a collection of audiotape reels stored at Martin University in Indianapolis. What Chism had discovered were the broadcast masters, and likely the only extant recordings, of the 1970s radio series, The Afro-American in Indiana. Since MDPI was scheduled to begin the following year, we discussed the possibility of prioritizing these tapes for digitization. Thrilled by this opportunity, Chism negotiated the donation of the entire collection to the AAAMC. The catalyst behind Chism’s desire to preserve the radio series was her research into the life of Fr. Boniface Hardin (1933-2012), the first African American priest of Holy Angels Parish on the northwest side of Indianapolis, and founder of Martin University. Fr. Hardin and Sister Jane Schilling initiated, produced and hosted The Afro-American in Indiana from 1971 to 1983 as part of their mission to promote black history to a broad audience. The weekly half-hour radio program was broadcast over Indianapolis public school station WIAN-FM, and focused on the local experiences of African Americans, reaching back to the beginnings of statehood. Only a few programs had previously been transferred to audiocassette, so the contents of the remaining 120 programs were something of a mystery. Descriptive metadata was limited to a very brief title on the tape box, such as “Civil War–Reconstruction” and “Noble Sissle, Indpls. Musician.” Names of hosts or special guests were seldom indicated, and several tapes bore the titles of different series, such as Reflections in Black and Black Heritage, which presumably were initiated or produced by Fr. Hardin. Tape labels also provided basic technical metadata and hinted at the broad scope of the subject matter: sports, music, education, historiography, slavery, the Civil War and Reconstruction Era, WWI, WWII, segregation, the Indiana and U.S. Constitutions, religion, the NAACP, medicine, law, black businesses, prison, labor history, and more. The Afro-American in Indiana uniquely captures the role of community radio in broadcasting locally-relevant and culturally-specific programming during the Black Power era. The radio series is also a lasting testament to Fr. Boniface Hardin’s significant efforts to promote African American history to a diverse audience and educate the local populace. We’re hoping to complete the indexing project and collection finding aid prior to the publication of Chism’s forthcoming book, Pickin’ Cotton on the Way to Church: The Life and Work of Father Boniface Hardin, to be published by the Indiana Historical Society Press. The Afro-American in Indiana series will also be added to the Radio Preservation Task Force’s online inventory of extant American radio archival collections. Meanwhile, all of the programs uploaded to IU’s Media Collections Online streaming site are publicly available for the first time since they aired forty years ago. To learn more about Chism’s research and the life of Fr. Hardin, see Liner Notes Vol. 21 (the AAAMC’s annual newsletter).